Starbucks announced the next step in building the instant coffee category with the introduction of Starbucks VIA Flavored Coffee in U.S. and Canada stores this fall. Just one year since the launch, the Starbucks VIA Ready Brew portfolio will now include four natural flavors—Vanilla, Mocha, Caramel, and Cinnamon Spice. Starbucks is the first nationally branded flavored coffee in the U.S. to use only natural flavors and other natural ingredients and offers Starbucks Natural Fusions, a line of naturally flavored ground coffees, at select grocery stores in the U.S.
Starbucks spent years looking for high-quality natural ingredients to combine with natural flavorings and its arabica coffee to get the perfect cup of coffee. 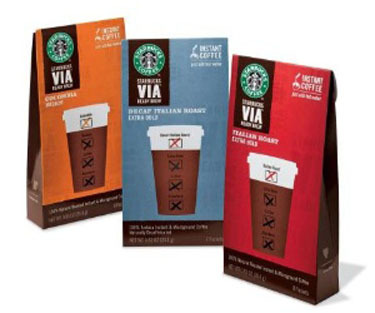 The introduction of these two distinctively different natural flavored coffee lines, instant and ground, is part of Starbucks’ overall business strategy to grow its consumer products and retail businesses. With approximately 11 percent of American households purchasing flavored coffees, Starbucks is entering the $377 million flavored coffee market in the U.S. Having two forms of flavored coffee, instant and ground, in different distribution channels meets the variety of ways customers drink their coffee—whether it is at home or on-the-go.